When shopping for a kids room you have to look for the little stuff that will make the theme pop with that character. 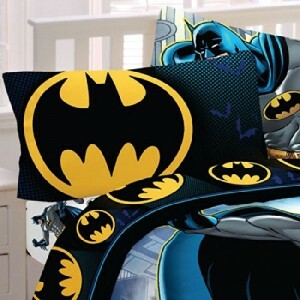 These Batman room accessories feature just about all the basics to make a kid feel like he lives in the Bat Cave. If your looking to add a serious focal wall to your kids room or even your office than this giant Batman wall decal will surely meet all your geeky needs. It’s huge! Measuring 42″ x 33″ and is super easy to apply just peel and stick it to any smooth flat surface. It’s easy to remove and won’t damages walls so using this in a rental is perfectly fine. 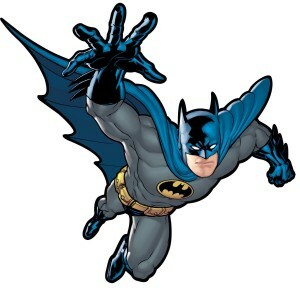 This decal features the retro blue Batman color scheme with him leaping into action. Now you can contain your kids gross and funky laundry in supreme style with this fab hamper! It of course features Batman with the bat mobile in the background and a full action scene. The Hamper measures 21″ tall and the 13.5″ wide. It collapses down flat when not in use (like that will ever happen) and is great for storing toys or clothes. 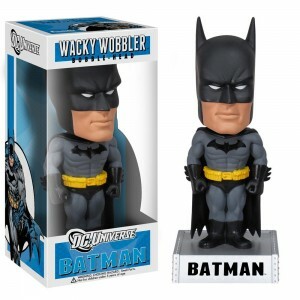 Nothings says die hard Batman fan quite like one of these charming Batman bobble heads by Funko. Kids, teens & geeks from around the world love these…I should know, I have one on my desk! Batman stands 7.5″ tall and is on a Base emblazoned with his name. This is the black version complete with tool belt, spiky cuffs and cape. Kids love to flop on stuff, Why not get them a chair dedicated to slouching & flopping? 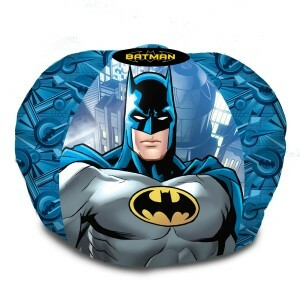 This groovy beanbag chair has the blue Batman with a comic style design & Blue accent panels with the logo. It measures 18.5″ x 18.5″ so it’s for smaller kids & not teens. When tricking out a room you can’t overlook the bedding, the bed is the focal point of a kids room! This bedding set features a bold black and yellow classic logo on the pillow and reverse of the comforter. 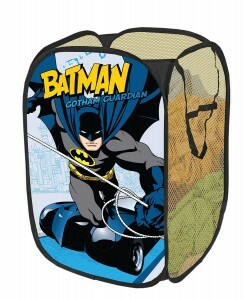 The blue batman is in fine graphic detail & perfect for kids…or adults that Love Batman.